Washington, D.C., December 8, 2017 – The Clinton administration made plans for war against North Korea during the 1994 nuclear crisis. While U.S. officials believed they could “undoubtedly win,” however, they also understood “war involves many casualties,” according to documents posted today by the George Washington University-based National Security Archive. Today’s posting features declassified cables, background papers, and reports of meetings involving former Defense Secretary William Perry, other senior Americans, and North and South Korean officials. Together, the documents describe key moments and thinking during the course of the complex negotiations of the 1990s. Perry and others had hopes the incoming Bush team would carry the effort forward (as Colin Powell indicated they would), but President Bush quickly informed President Kim he would be terminating all talks with the North. The current deepening crisis driven by North Korea’s nuclear weapons and missile programs makes understanding prior efforts to resolve this long-standing security threat on the peninsula all the more urgent. An earlier National Security Archive Electronic Briefing Book posted documents that dealt with efforts of the George H. W. Bush administration to engage Pyongyang in talks that could lead to a Korean peninsula free of nuclear weapons. As that posting discussed, the early hopes engendered by this U.S. initiative were eventually dashed as suspicion grew that North Korea did not intend to abide by its commitments to open its nuclear facilities to international inspection. The range of outcomes for the Four Party talks that began in December 1997 ranged from the collapse of North Korea due to economic failures to the possible, though unlikely, adoption of reforms that would give the DPRK new vitality. The U.S. held modest expectations for the talks, knowing they would be “tedious and subject to constant tensions,” exhibiting the usual North Korean modus operandi: “being obstreperous, applying pressure, and then relenting in the end.” There was also appreciation of the risk that, if North Korea felt the U.S. and its allies were failing to carry out their commitments to Pyongyang under the 1994 Framework Agreement, they may seize on this as an excuse to resume their nuclear weapons program. Throughout, the U.S. gave high priority to consultations and coordination with South Korea and Japan, and to engaging China to bring its influence to bear on North Korea. Finally, though U.S. policy included sanctions as both carrot and stick, there is little discussion of military options. Possibly this is the result of the Clinton administration’s examination of such options against North Korea during the 1994 nuclear crisis. As former Secretary of Defense William Perry told Kim Dae Jung, while its war planning showed that the U.S. and South Korea would prevail in a war, there would be many casualties. A brief sketch of the historical backdrop to the documents posted today can provide the necessary context. The mounting concerns at the end of the Bush administration about North Korea’s nuclear weapons program reached a head during the first Clinton administration, leading to the 1994 crisis during which the U.S. gave serious consideration to military action to take out Pyongyang’s nuclear facilities, only to reach agreement with North Korea on the 1994 Framework Agreement. Under this agreement, North Korea agreed to halt its nuclear weapons program and open its nuclear facilities to inspection, while the U.S. and other nations agreed to supply North Korea with heavy fuel oil to meet near-term needs, and international financing would be provided, under the aegis of the Korean Peninsula Energy Development Organization (KEDO), for construction of light-water reactors. Seeking to build on this progress, President Clinton and South Korean president Kim Young Sam at their meeting in April 1996 proposed Four Power talks (the U.S., South Korea, North Korea and China) to negotiate a peace treaty to replace the armistice that ended the Korean War. These talks would be complemented by bilateral discussions between the U.S. and North Korea on nuclear weapons and missiles, and by the ongoing North-South dialogue that sought to make progress on issues such as economic cooperation and reuniting families divided by the Korean War. A key concern of the U.S. and South Korea was that their North Korea policies should be coordinated so that these inter-related negotiations could have a synergistic effect, with success in one venue serving to build momentum and confidence in the others. Movement on all these fronts was hindered by several factors. Following the death of North Korean leader Kim Il Sung in July 1994, it took time for his son and successor, Kim Jong Il, to consolidate his control of the regime. North Korean provocations such as the infiltration of commandos into South Korea via submarine (they were either killed or captured) in September 1996, and the seizure of a DPRK submarine in South Korean waters in June 1998, tested South Korean resolve to engage with Pyongyang. Bilateral U.S.-DPRK talks aimed at stopping the latter’s missile program, which saw five rounds between 1996 and 2000, made little headway. 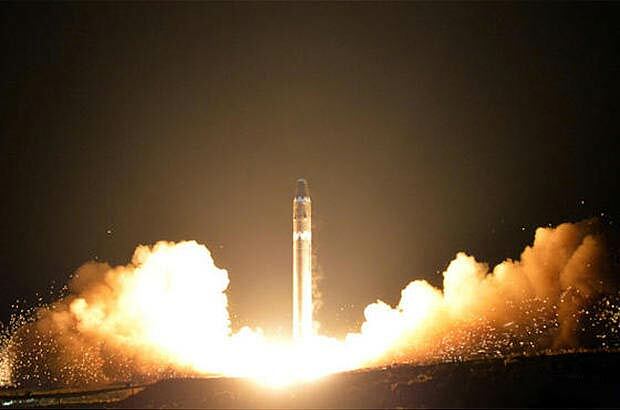 North Korea continued to develop and deploy long-range missiles capable of striking South Korea and Japan, and furthermore engaged in the sale of Scud missiles to Iran and Syria, actions which brought new U.S. sanctions against the DPRK. It was not until late 1997 that China agreed to take part in the Four Party Talks. Other obstacles arose along the way. Direct talks between the two Koreas, prompted in part by North Korea’s need for chemical fertilizers from South Korea to address its food shortages, collapsed quickly when North Korea rejected Seoul’s desire to use the talks to arrange for the reunion of families divided by the partition of the country. Intelligence reports in 1998 indicated that North Korea might have built an underground complex to secretly resume its nuclear weapons program. Finally, the economic crisis that hit Asia in 1997 put in doubt South Korea’s ability to meet its commitments to provide financing for the construction of light-water reactors in North Korea, a critical component of the 1994 Framework Agreement. Engagement with North Korea received a new impetus in 1998. First, newly-elected South Korean president Kim Dae Jung, a political reformer and former political prisoner, looked to reengage with North Korea through his “Sunshine Policy,” as part of which he called on the U.S. and other countries to ease sanctions against North Korea and show greater flexibility in pursuing political and economic engagement with the regime. 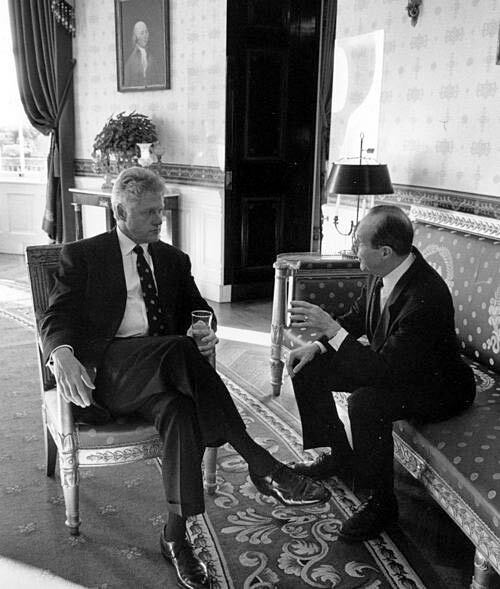 In the U.S., President Clinton named former Secretary of Defense William J. Perry to serve as North Korea policy coordinator in November 1998 (a position established by Congress) and to prepare a study setting forth recommendations for U.S. policy toward the DPRK. As Perry carried out his review, one obstacle to progress was removed when North Korea agreed in late 1998 to U.S. inspection of the suspected nuclear site at Kumghang-ri; these inspections in 1999 discovered no covert nuclear facility. 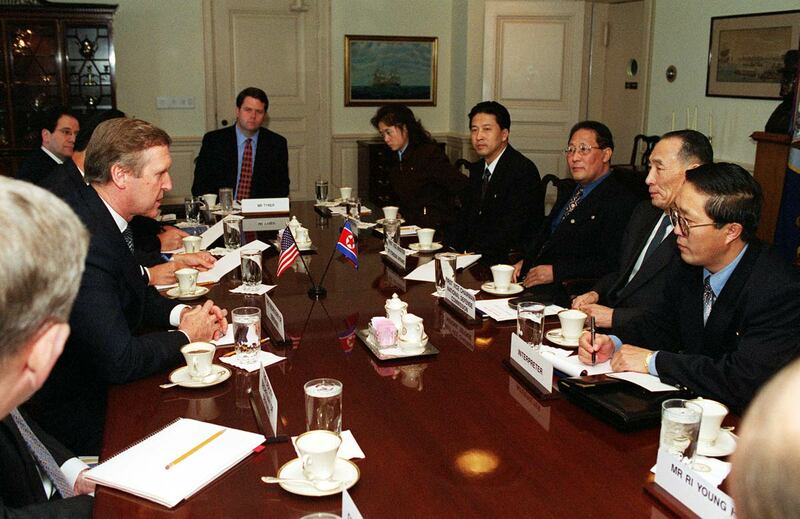 Then Perry, following consultations with South Korea and Japan (who joined with the U.S. in creating the Trilateral Coordination and Oversight Group, or TCOG, to coordinate their policies regarding North Korea, went to Pyongyang in May 1999 to present his ideas on improving U.S.-DPRK relations to high level North Korean officials. As Perry told the North Koreans and elaborated in his report, submitted to President Clinton in September 1999, the U.S. was prepared to accelerate diplomatic and economic relations with North Korea in exchange for DPRK steps to curb its nuclear weapons and missile programs, but also stood ready to adopt more coercive measures, i.e., sanctions, if North Korea proved unwilling to take the steps required to assure the U.S. and its allies. President Clinton moved quickly to act on Perry’s recommendation, ordering a broad easing of economic sanctions against the DPRK as a first step in a long-term plan to persuade Pyongyang to give up its nuclear and missile programs. Then, in March 2000, Kim Dae Jung gave a speech in Berlin in which he called for bilateral official talks between the two Koreas. This led to the historic summit meeting between Kim Dae Jung and Kim Jong Il in Pyongyang in June 2000. The summit raised new hopes for reconciliation on the peninsula, as cordial and productive meetings resulted in a joint declaration in which the two leaders agreed to work together to resolve reunification issues, address humanitarian issues such as exchange visits by divided families, and cooperation on economic initiatives. This in turn led to the further easing of sanctions by the U.S. The U.S. also moved to reenergize bilateral talks. 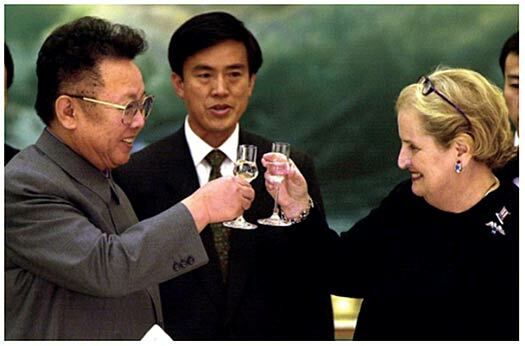 In July 2000, Secretary of State Albright met with North Korean Foreign Minister Paek Nam Sun in Bangkok for talks that were more symbolic and substantive. This was followed by U.S.-DPRK talks in Washington, D.C. in September on nuclear issues, missiles and terrorism, which led to Pyongyang sending Vice Marshal Jo Myong Rok to Washington as a special envoy to meet with Clinton and Albright. These meetings in turn laid the basis for Secretary Albright’s visit to Pyongyang in October, where she met with Kim Jong Ill and discussed U.S. proposals to curb North Korea’s missile program, in return for which the U.S. would provide financial assistance and arrange a visit by Clinton to North Korea. In late December, President Clinton announced he would not be able to visit North Korea, a decision probably made in light of perceived opposition from the incoming George W. Bush administration. Still, there was hope that the outgoing administration would hand off North Korean relations in much better shape than when Clinton entered office. Perry recalled that he briefed incoming Secretary of State Colin Powell on the Clinton administration’s negotiations with North Korea, and Powell told Perry that he planned to follow up on these talks and work to bring them to a successful end. Powell also gave similar reassurance to Kim Dae Jung when he visited Washington soon after President Bush’s inauguration. However, when Kim met with Bush that same day, the president told him that he was ending all talks with North Korea, a step that Perry deeply regretted. So, once again, a period of cautious hope in U.S.-Korean affairs would fail to live up to its promise. It would be several years before the U.S. sought to reengage with North Korea, time which the communist regime used to press ahead with its nuclear and missile programs. The reasons for North Korea’s decision to break its commitments are still subject to debate, and this history colors all current efforts to address the regime’s security threat to the peninsula and the region. This overview draws upon the essay and chronology found in The United States and the Two Koreas, 1969-2000, Guide and Index, The National Security Archive ( Chadwyck-Healey, 2011), unless otherwise noted. A good narrative history of U.S.-Korean relations during the Clinton administration can be found in Don Oberdorfer. The Two Koreas: A Contemporary History (Basic Books, 1997, 2001), chapters 12-16. A detailed account of the Clinton administration’s response to the first North Korean nuclear crisis and negotiation of the Framework Agreement can be found in Joel S. Wit, Daniel B. Poneman, and Robert L. Gallucci, Going Critical: The First North Korean Nuclear Crisis (Brookings Institution Press, 2004). For additional documents on the Clinton administration and North Korea, see The United States and the Two Koreas, Part II: 1969-2010, National Security Archive Electronic Briefing Book no. 475, posted June 5, 2014, available at https://nsarchive2.gwu.edu/NSAEBB/NSAEBB474/. For documents on Secretary Albright’s visit to Pyongyang, see Electronic Briefing Book no. 475, cited above, as well as North Korea and the United States: Declassified Documents from the Bush I and Clinton Administrations, Electronic Briefing Book no. 164, posted August 23, 2005. See “The North Korean Policy Review: What Happened in 1999,” loc. cit.